Although Martin Luther King, Jr. Day isn't until Monday, the City of Little Rock got a head start on the celebrations and joined together to remember and honor the memory of the civil rights activist. LITTLE ROCK, Ark. — The City of Little Rock got a head start on the celebrations and joined together to remember and honor the memory of the civil rights activist. This was the first Martin Luther King, Jr. Unity Program in Little Rock. Mayor Frank Scott, Jr. wants this to be a tradition that continues to remember his impact. 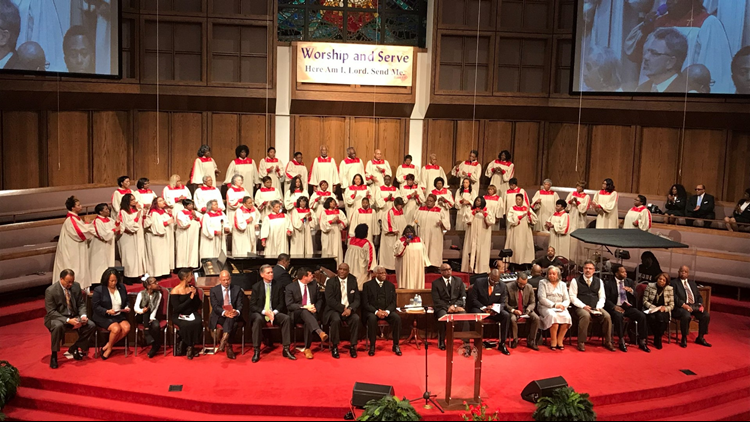 Through songs, prayer, and the reciting of a speech the Little Rock community honored Dr. Luther King in hopes or further uniting the city. “What better way to do it then while honoring Reverend Dr. Martin Luther King, Jr. who is the epitome of unifying our nation,” Mayor Scott said. Community leaders met at St. John Missionary Baptist Church for the inaugural program. Mayor Frank Scott said it’s important the city hosts their own event, something that wasn’t done in past years. The inspiring songs and messages left many feeling hopeful for Little Rock’s future. “It gave us motivation to get out and work and volunteer and do our part to improve our city,” Crystal Vann Simmons said. The diverse audience shared prayers of thanks, unity, and potential. “We all are brothers and sisters and what Martin Luther King advocated was us working together, being one big family,” Simmons said. Mayor Scott said Dr. King played a significant role in his life and hopes to keep his spirit of togetherness alive. “He’s so important to me because if there’s no Dr. Martin Luther King, Jr. there’s no Frank Scott, Jr. because he was one of the great civil rights icons that made certain that we were all able to be able to afford the civil rights that we now have today to make certain we continue to have a greater future for our entire nation,” Mayor Scott said. Mayor Scott said there are already plans to have the event at another location next year where residents can continue to build unity within the city.